M.D. and M.Sc. degree programmes in the following areas: Cardiology; Nephrology; Neurology; Endocrinology; Gastroenterology; Respiratory Medicine (Pulmonology); Rheumatology; Infectious Diseases; Clinical Pharmacology/ Therapeutics; Dermatology. The Institute of Public Health offers M.Sc., DrPH and PhD. programmes in the following areas: Health Systems, Policy and Management; Epidemiology and Biostatistics; Health Promotion and Communication; Environmental and Occupational Health; Clinical Epidemiology; Bioethics. The Centre offers PGD, M.Sc. and Ph.D. degree programmes in Environmental Management & Control; M.Sc. in Disaster Risk Management; M.Sc. in Chemical Security Management. The Faculty of Law invites applicants from candidates for admission into Ph.D programmes in the following departments: Commercial and Corporate Law; Customary and Indigenous Law; International and Comparative Law; Jurisprudence and Legal Theory; Private Law; Public Law and Property Law. Candidates for admission in the Faculty should possess relevant Master’s degree with at least 3.50 GPA on 5-point scale or 3.0 GPA on 4-point scale. NOTE: that the GPA for admission into the Departments in the Faculty is not 4.0 on 5-point scale as earlier advertised. ii) Candidates with professional qualifications including HND must have obtained 5 credits in WASC or GCE O/L including English and Mathematics. iii) For Candidates, who hold qualifications other than the above which are acceptable to the Board of the School of Postgraduate Studies and Senate of the University, may also be considered for admission. Candidates should fill in their referee full names and emails online. A link will be sent to the email addresses of the referees. The referees are to complete the online referee forms and submit same online. The contents of the referee forms will be available to the School of Postgraduate studies and also available for print out by the respective applicants. Please, note that applications would not be processed unless the referees’ reports are available. *Enter correct email addresses of your referee. 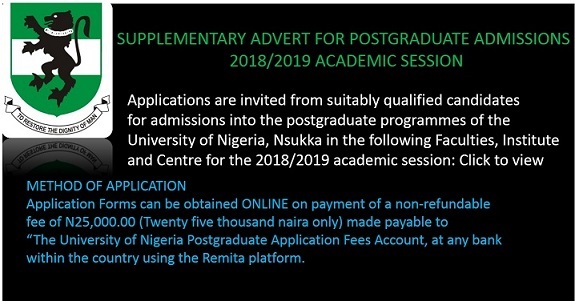 Candidate should download transcript request forms (D2) also provided online, and submit to their former Universities/Institutions to forward with a copy of Academic transcript(s) to “The Secretary, School of Postgraduate Studies, University of Nigeria, Nsukka” to reach him/her not later than 9th November 2018. Candidates whose transcripts are not received on or before the deadline by the School would not have their application forms processed. All accompanying documents should be placed in the file Jacket, specified in (b.ii) and the File Jacket should be placed in brown envelope as specified in (b.i.) above. Online sale of Supplementary Application Forms starts from 3rd October, 2018 and ends on 2nd November, 2018. Check out for information on screening processes via the UNN Website:unn.edu.ng or www.spgs.unn.edu.ng from 26th October, 2018 after submitting the completed application form. Date of the Supplementary Screening Test: To be announced.